Efficient Home Solutions delivers Energy Efficient Home Improvements that increase home comfort and reduce your monthly utility bills without requiring a large upfront cash expenditure. Efficient Home Solutions is always working hard to provide our clients with Financing Options that provide reasonable opportunities for hard working families who qualify to obtain 6 months to 18 months interest free financing with a minimum payment of $200 per month and a 12% to 19% interest rate after the initial interest free term expires through G.E. Capital. Call today to speak with a consultant about our products, services and financing. Efficient Home Solutions offers special financing options with approved credit through Wells Fargo Financial National Bank, an Equal Housing Lender. Call to speak with a representative about our products, services and financing options. 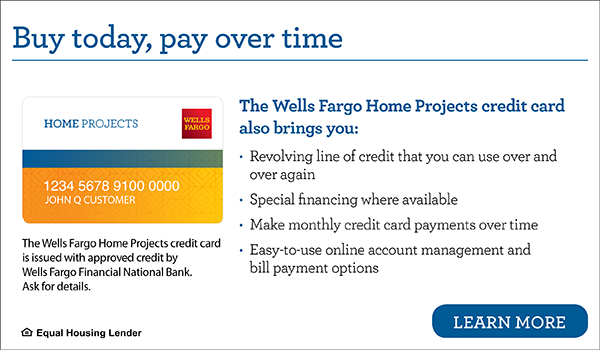 Find out more about Wells Fargo Financial National Bank’s Home Projects Financing and Apply Online.